As NCAA Basketball fast approaches, we take a look at a favorite “Horns” series and its options from the Duke Blue Devils. In the 2016-17 season, the Duke Blue Devils were tops among major conference programs with 67 field goals made from handoffs. While Duke gets many of its handoffs in the flow of their offense, there is one handoff heavy set the Blue Devils use that significantly adds to the total. Horns Elbow Clear is a go-to set for the Blue Devils and handoffs coupled with clear outs are the featured elements. As the name implies, Duke begins in a “Horns” alignment and enters to the elbow. That prompts the player in the corner to cut along the baseline to the far corner creating the cleared out side. 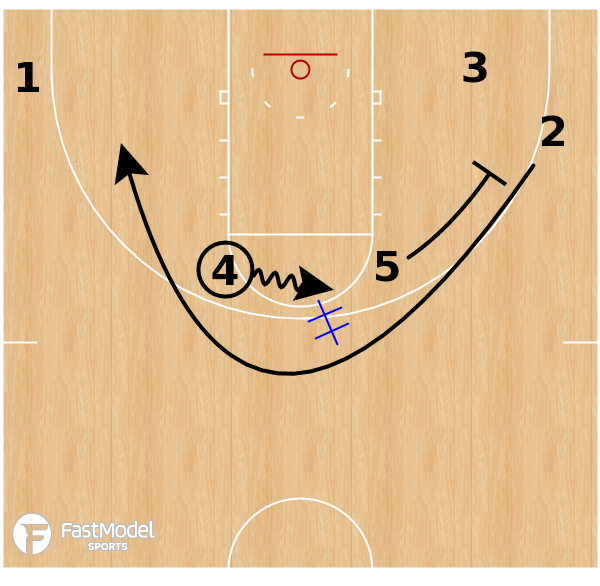 Often the corner player’s defender falls victim to what we call a “sucker cut.” He follows the offensive player out of the lane instead of stopping in Low I help position. 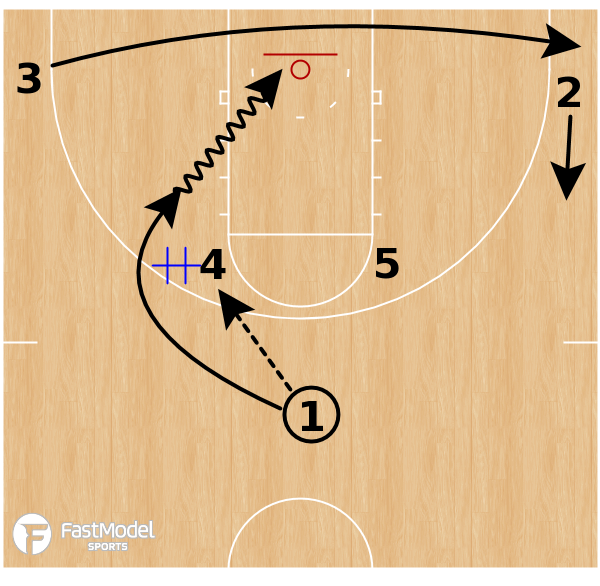 The clear out paired with the defender following the baseline cutter out of the lane leaves no help as the passer sprints to take the ball back from the elbow player. In many of the first few clips in the video below you see the corner defender turn his head an chase the baseline cutter out of the lane. The result is often a layup or dunk. It is not always this easy for the Blue Devils as teams will force Duke to their second option in this set. If Player 1 does not receive the handoff, he/she cuts to the corner. The elbow player who did not receive the entry pass turns and down screens for the corner player on his/her side. The cutter comes off the down screen straight into the handoff from the entry man and attacks the rim with a small advantage. Player 1 holds the corner; should his/her defender provide corner help that presents a drive and kick opportunity. To exploit favorable matchups and counter the defesne, Duke also employs a couple of wrinkles from this series. First there is the “Fake & Take” option. The elbow entry pass and clear out remain the same but the big at the elbow opposite the entry fakes as if setting the down screen then takes the handoff. The recipient may shoot coming out of the handoff or attack if his/her defender trails. Again, Player 1 is holding the corner for a potential drive and kick. Another wrinkle is the forced curl option. The elbow entry pass, clear out and weakside down screen remain the same. In this option the cutter on the weakside curls the down screen and the screener comes back into the handoff. The first cutter curls and the screener becomes the second cutter who takes the handoff. The recipient may shoot coming out of the handoff or attack if his/her defender trails. Again, Player 1 is holding the corner for a potential drive and kick. Traditionally Duke plays with one of the more fluid offenses in college basketball made better with a stable of talented players. The Horns Elbow Series creates space for their talented players to attack an empty side. 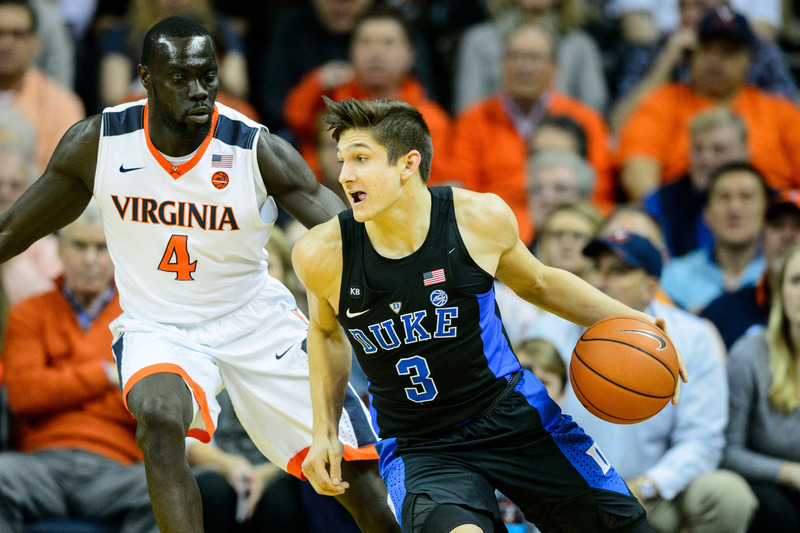 The Blue Devils can tailor the options to exploit the most favorable matchup. As the NCAA season approaches look for Duke to retain this series in their playbook.